When I think of chocolate chip cookies, I have a go-to recipe that I rarely waver on. It’s one that originated on the back of a bag of chocolate chips and over the years melded into a recipe that better matched my own personal palate... a cookie that is subtly crisp on the outside, though relatively supple on the inside. Not overly sweet. Not wafer thin, not super-sized. And never snap-crackle crisp. While I always consider that particular recipe a chocolate chip cookie recipe, I can’t remember a time that I made it and not added a good heap of quick-cook oats. That bit of oats makes all the difference in the texture and consistency of the batter… and ultimate cookies. Not to mention the flavor. So when Stemilt suggested a chocolate chip cookie recipe when it came time to work with a few of their beautiful, ripe pears… I had to rethink my tried and true way of doing things. Adding fruit to cookie batter isn’t new… especially dried fruits. Adding fresh fruit takes a little more thought… for me, at least. A purée of fresh fruit adds flavor as well as sweetness to a cookie batter. It also loosens the consistency so it requires a little balancing of flours, sugars, butter, etc. And, what about incorporating fresh pear? 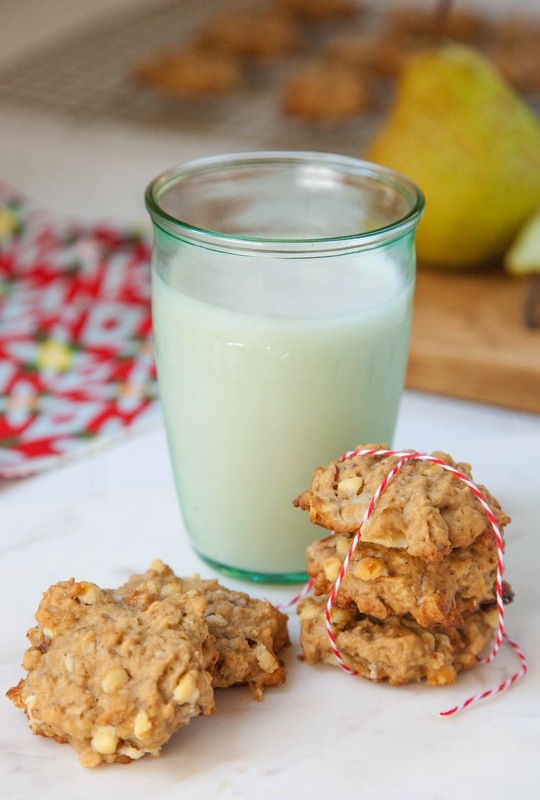 Well… in many applications white chocolate, almonds and oats pair beautifully with pears... so a chocolate chip cookie didn’t seem too far fetched. Adding fresh fruit is a sweet option to reducing the refined sugar component in cookies. The trade off is a bit of crispness. The solution is to keep them petite. Fresh out of the oven, with a little rest to cool, they are at their peak level of crispness. They soften a bit over time... but that doesn’t temper their appeal. 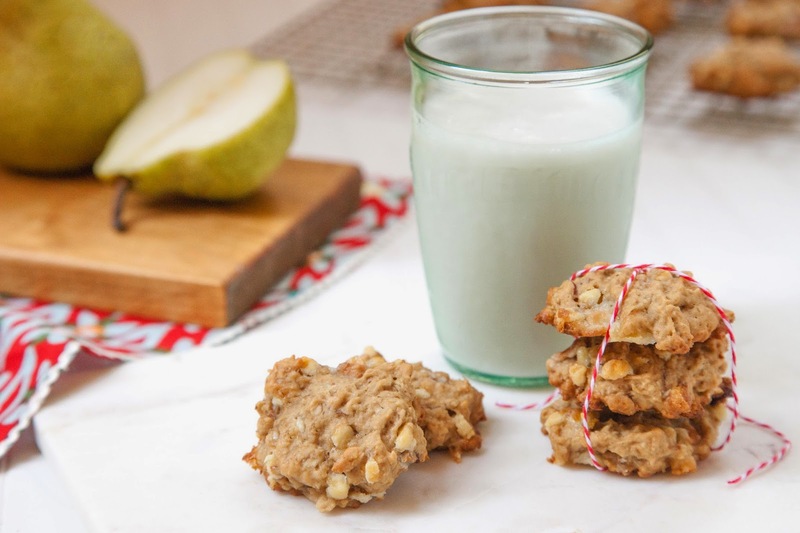 In these wee cookies, fresh pear is introduced in both a puréed form and a diced form... the sweetness of which keeps the need for refined sugar to a minimum. The end result is a cookie that tastes like it should be healthy for you... with just a delicate sweetness. Little bits of white chocolate chips and almonds add a delicious pop of decadence and crunch… subtle reminders that moderation is still the best policy... even if the cookies are tastefully disguised as healthy morsels. Disclaimer: While I am being compensated by Stemilt Growers as a guest contributor to The Stem, the views and/or opinions expressed on A Savory Nest are my own.